Horse, or equine, dentists are employed to carry out regular routine checks on horses mouths to help maximise the animal’s riding and eating performance. It is specialist work. Why do Horses Need Dentists? In the wild, horses eat a greater mixture of coarser grasses and forage than they are provided with in a domestic situation. Their teeth were designed to graze for 16-18 hours a day. Changes brought about by domestication can result in the development of sharp enamel points and protuberant teeth that may lead to problems when feeding and being ridden/driven. 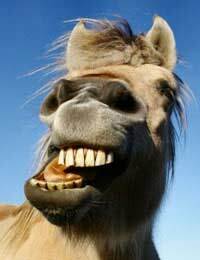 The normal adult horse has at least 36 teeth. Up to 4 wolf teeth and/or canines may also be present, 6 of which are upper incisors, 6, lower incisors. These are the teeth that tear grass. There are 3 pre-molars and 3 permanent molars (also known as cheek teeth) used togrind the horse’s food. Grinding surfaces on horses teeth are called tables. What Does a Horse Dentist Do? Although this is specialist work, equine dentists are not always appropriately qualified, nor are they veterinarians. If a horse needs more complex dental treatment under sedation, aqualified vet must administer the sedative. Horse dentists are not permitted to carry out acts of veterinary surgery but there are clinics and practices that specialise in equine dentistry. If a horse loses condition for no apparent reason, starts dropping half-chewed food (quidding) drools or salivates excessively, has bumps or swellings on its face or jaws, it could be experiencing some tooth trouble. Other signs include, head throwing when being ridden, stiffness on one rein, tilting of the head to one side, rearing and unusual tongue carriage. Horses that are normally even-tempered may become generally ‘off’ if they have a problem in their mouths. Veterinary surgeons may recommend a horse dentist. Ideally, horse dentists are invited to check their patients at least once a year to carry out routine assessments, but this decision is the owners! Examining several horses at one location is a cost effective way for owners to have their horses teeth checked regularly because it saves time and travelling expenses for the dentist, who may otherwise have theadditional expense of travelling from one horsey home to another. It is an efficient way forthe dentist to carry out routine checks. The dentist carries a selection of instruments including: the mouth speculum-a shiny polished metal device that holds the horse’s mouth open and acts as a mirror to enable clear examination; a head torch for the dentist to shine in the horse’s mouth if necessary for better visibility while keeping hands free; different grades of carbide blades for rasping the teeth; syringes to wash out the mouth; anti-bacterial mouthwash; dental charts to record diagnoses and treatment. There is a 3-year degree course available that covers the theory side of horse dentistry. Although there are apparently no legal qualifications required, at present, regular work with an experienced equine dentist is recommended in addition to the degree course. Training towards the practical assessment is required for an equine dentist to practice in the UK. Qualifications from other countries are not recognised. Charges are usually made per horse and can vary greatly. The average is around £20.00per horse-which is why group checks are encouraged! The negative side to this is that if any contagious diseases are in one equine dentist’s area, outside work will almost certainly have to cease. As most horse dentists work alone, the choice of how many horses a day/week are booked is up to the individual.